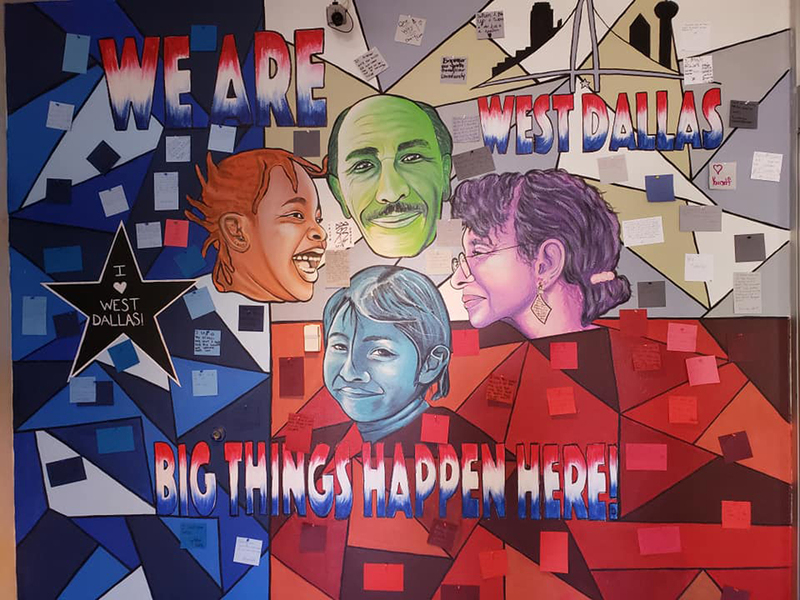 The West Dallas Community Center offers a variety of services including programming for senior citizens, healthy meals and education counseling offered by El Centro Community College. But apart from these offerings, the center functions as a meeting place for the neighborhood. Walk in and see locals chatting over coffee or people playing card games. The smell of home-cooked lunch waifs through the halls. 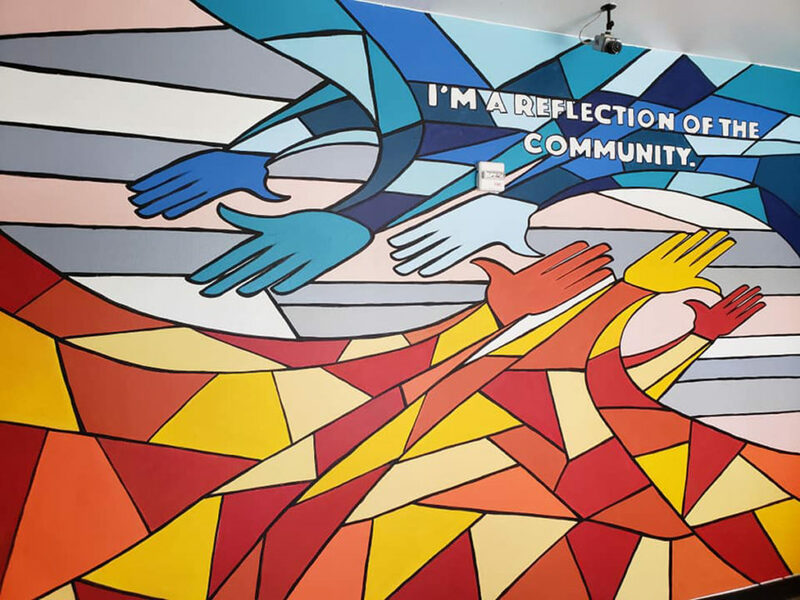 This community center is welcoming and warm, yet the building itself didn’t reflect the energetic and diverse community that the center serves. But now that local muralists, Reggie and Sanah Bowers have arrived to work with students at Dallas City of Learning a whole new look welcomes visitors and showcases the vibrant personality West Dallas. 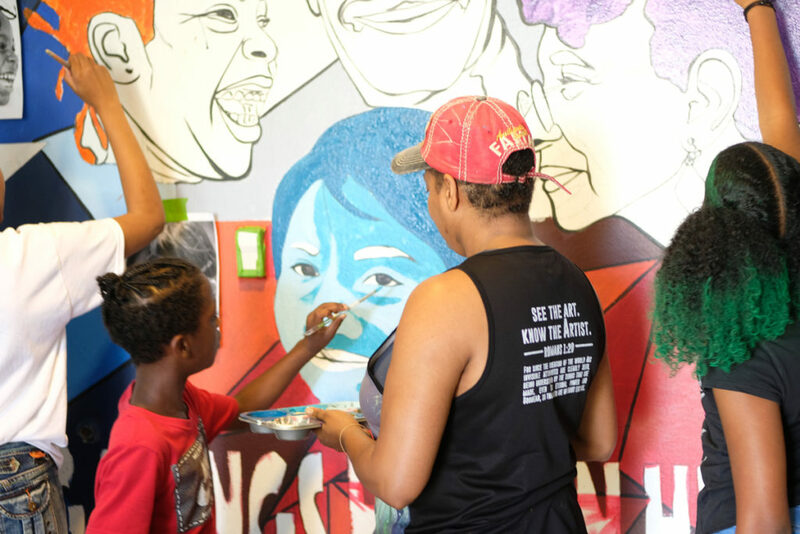 Reggie and Sanah Bowers are constantly seeking ways to do good in the Dallas community through their art. 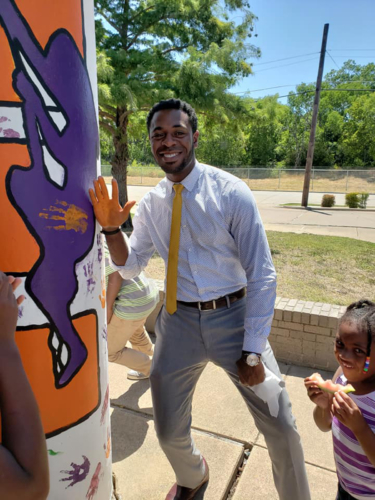 Reggie, a military veteran and artist, is currently working on a masters in Social Work and learned about Big Thought through a professor who knew of his passion around art and children’s well-being. 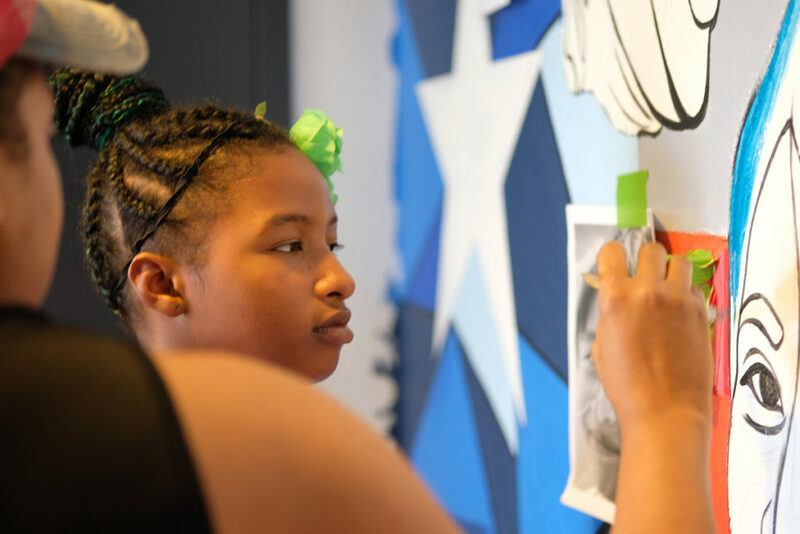 Sanah, an experienced photographer and artist, heard about Big Thought for years and thought this would be good opportunity to get involved and work with kids in the West Dallas community. 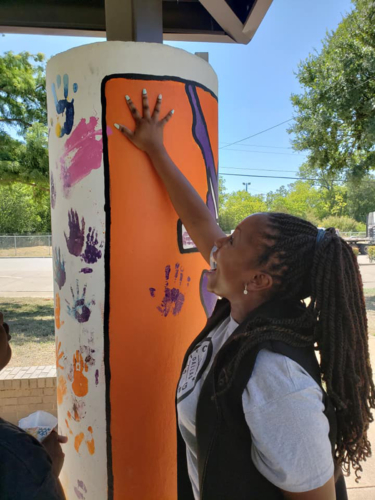 This led to both artists utilizing their talents to teach art through the design and development of three mural projects at the West Dallas Community Center. 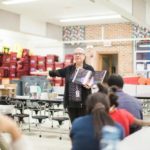 Some students had never taken an art class so the entire process gave students the chance to learn the foundations of art from professional artists. Inspired by the West Dallas community, Reggie and Sanah wanted each piece to be a direct reflection of the community showcasing the warmth, diversity and energy of the neighborhood. 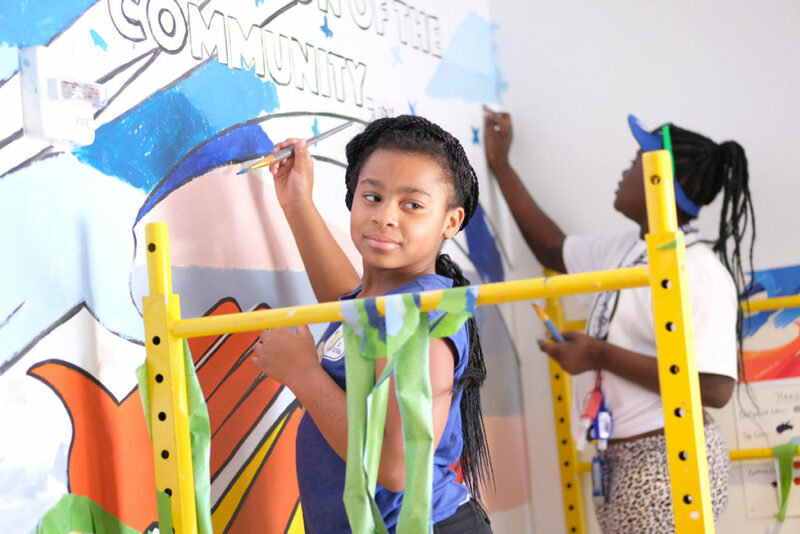 An average mural takes about 60 hours to complete, but with lots of little hands, Sanah emphasizes that painting three murals can be a little challenging. 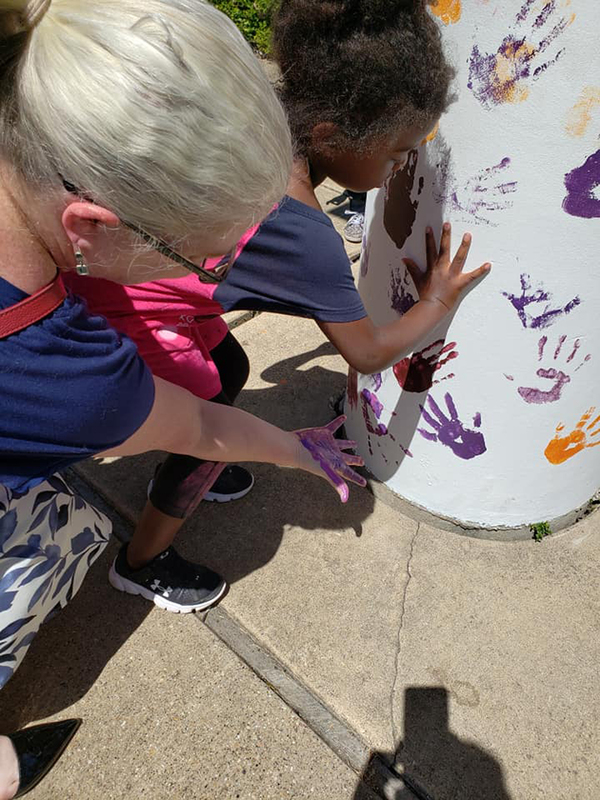 “The initial challenge was getting them to focus and not paint everything at once, but now they understand how to paint a mural.” Students loved coming to camp everyday to paint the murals and see how they change everyday. 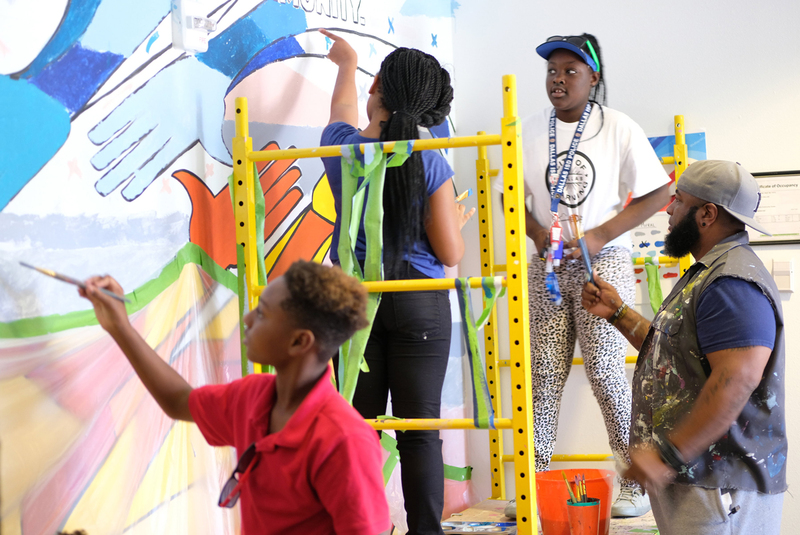 Reggie and Sanah agree that their overall goal for these murals was not only to teach art to students, but also to connect them to their neighborhood in a deep and meaningful way. Community members joined in on that goal by leaving notes filled with advice and encouragement for students. These notes will be incorporated into the murals to show community support and showcase its generous spirit. 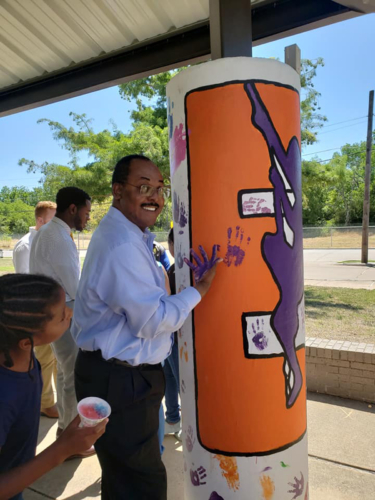 Now that these colorful murals have been completed visitors will instantly know that they are in a special place that is welcoming to all and committed to supporting education. Looking for creative ways to teach your child more about art and culture? Check out learning opportunities happening across Dallas at Dallas City of Learning! If your garden’s not growing, don’t blame the veggies. 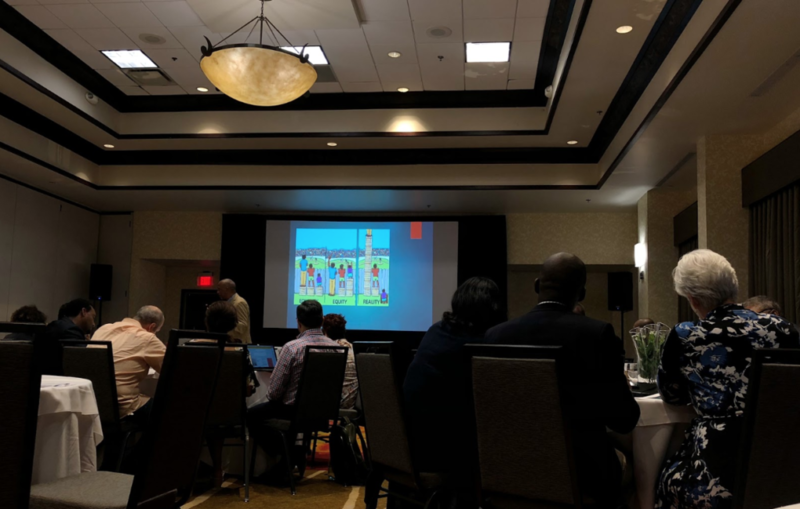 That was the lesson at the core of Dr. Pedro Noguera’s lecture this past Monday as part of Hayles Educational Incorporated’s Professional Learning Series. Noguera, the Distinguished Professor of Education at the Graduate School of Education and Information Studies at UCLA, has spent his career researching the influence of social and economic conditions and demographic trends on schools (Pedro Noguera). He understands that the majority of students don’t learn best in a traditional classroom structure. “The schools we have now were designed to obtain the current results,” he emphasized throughout the lecture. In order to improve, schools must adjust to students, rather than expecting students to conform to the classroom. That can only be accomplished by looking at the various factors that influence a child’s learning. When you plant a garden, you have to make sure to use quality soil, provide an appropriate amount of sunlight and irrigation, and keep out the weeds. Each plant requires attention and care. Similarly, when seeking to understand a student’s academic achievement, you must consider the various factors influencing that student’s growth. A child’s race, gender, socioeconomic status, or home life is likely to affect the way they learn. Assuming that every student learns the same way only creates barriers to learning. “We should not be surprised by the diversity of our children,” Dr. Noguera explained. 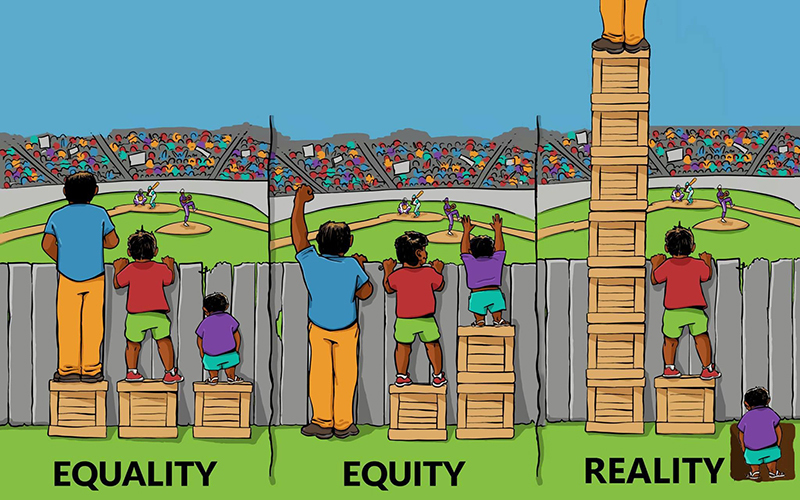 If schools are committed to deeper learning and equity, “educators should seek to understand each child’s individual learning needs” (Noguera, Darling-Hammond, and Friedlaender). 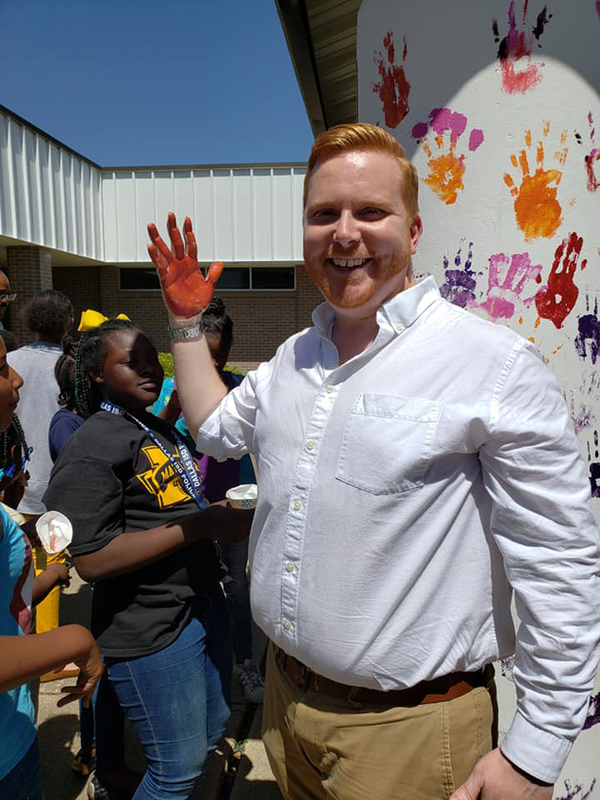 When teachers and administrators take the time to build relationships with students, those students receive the attention they need. 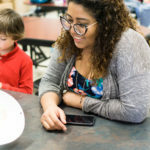 This personalized learning keeps kids invested in their education and community.